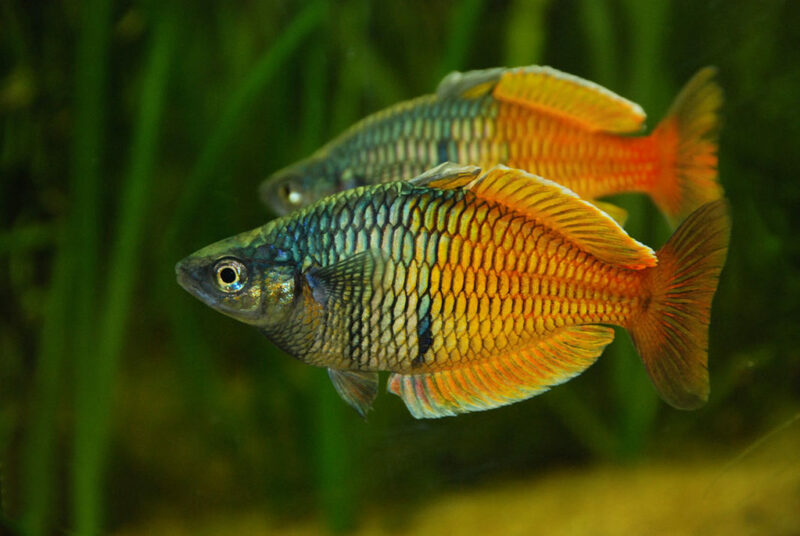 The beautiful colors of the Rainbowfish can be enhanced in the aquarium by using plants and installing compact fluorescent or high output T5 fluorescent bulbs. 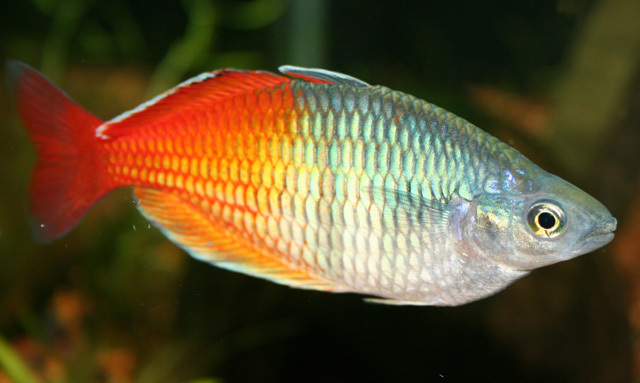 There are over 50 species of Rainbowfish with the most common species being the Red Rainbow or Spotted Rainbow. The Latin name for the Rainbowfish is Melanotaenia Fluviatilis. Their native habitat is in northern and eastern Australia and in New Guinea. They can be found in areas of heavy vegetation in freshwater lakes, ponds, rivers, swamps and streams. The Rainbowfish is not a large fish and the maximum adult size is usually between two to four inches in length. There are only a few species that grow up to eight inches. It is a schooling fish and there should be at least six Rainbowfish kept in an aquarium. This is to increase the visual impact of their coloration and to help overcome their shyness. It is also recommended to have more than one male in the group because they will show more brilliant colors when competing for the attention of the females. Equal numbers of each gender is preferable. The body of the Rainbowfish is sleek and streamlined which makes it a fast swimmer. Its eyes are abnormally large and its body is basically a greenish color with reds and blues and a dark horizontal bar. The scales help to reflect the colors of this fish, making it very colorful especially if there is good lighting in the aquarium. The males are more colorful than the female and this is true with many species of fish. The Rainbowfish is an egg layer and it builds a bubble nest for spawning. This is similar to the breeding habits of the Betta and Gourami. The water temperature should range from 68 degrees to 84 degrees Fahrenheit. The hardness can range from 7 to 22 on the DH scale. The ideal PH should be between 6.0 and 8.0. 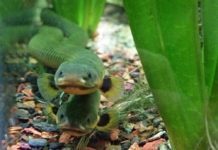 The water must be well filtered with weekly water changes of 25% or more depending on the number of fish in the aquarium. The Rainbowfish is non-aggressive and but very active like the giant Danio. 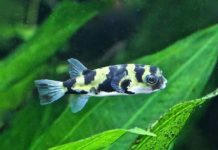 The aquarium size should be no smaller than a 33-gallon tank. This fish requires open swimming spaces and the idea aquarium should be long in order to allow more surface swimming space. The aquarium should have a tight-fitting lid because this fish is known to jump. The aquarium should have plenty of plants because their replicates the natural habitat of the Rainbowfish. A stark aquarium will make the Rainbowfish nervous and its colors will fade. In addition to plants, driftwood is ideal in order to provide hiding places. If planning to breed Rainbowfish, floating plants are needed for building bubble nests. 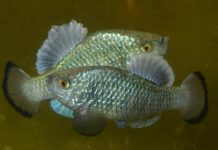 The Rainbowfish can be mixed with similar sized non-aggressive fish. It should not be mixed with smaller fish that are shy and easily intimidated because this will turn the Rainbowfish into a bully. 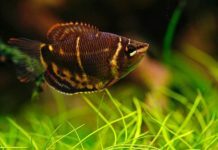 Larger Tetras and Barbs are good choices as tank mates as well as Discus and Angelfish or Blood Parrots. The Rainbowfish is not a picky eater. 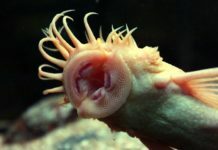 It will eat flake food, white worms, bloodworms, baby brine shrimp or brine shrimp. Because its natural habitat contains heavy vegetation, it should be fed vegetables such as lettuce and zucchini in addition to a vegetable enhanced flake food. 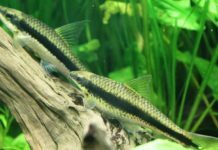 The aquarium should be set up with many fine-leafed floating plants or a spawning mop as the Rainbowfish is a bubble nest builder and will use the floating leaves as construction material in the building of the nest. 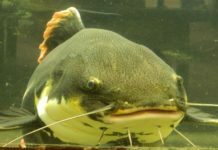 The fish should be conditioned with high protein foods and flake foods enhanced with vegetable matter for two weeks prior to introduction of breeding in the aquarium. The female will lay eggs in the floating plants or the spawning mop as directed by the male who has already picked out a spawning site. The egg laying can continue for a few days. The eggs should be removed as soon as the female lays them. If the eggs are not removed, they will be eaten by the parents. 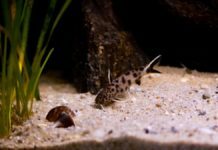 The fry will hatch in about seven days and should be fed liquid fry food until they are big enough to eat baby brine shrimp or live foods. The fry are very slow growers and need fresh clean water constantly until they are about three to four months old. This is the same with any fry in order for them to grow properly. As fry are growing, they emit a chemical from their body telling other fish and fry not to grow. This actually slows the growth rate. This is the big challenge that a breeder has to contend with. When buying Rainbowfish at a pet shop, don’t be discouraged if its colors are drab. 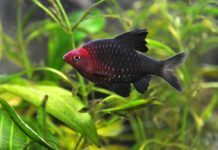 It takes time for young fish to develop their colors and lack of plant life and crowded conditions in a retail store tank do not allow the true colors of the Rainbowfish to show through. With a heavily planted tank and creating schools of Rainbowfish, its amazing colors can be appreciated.